Some events for your diary. Battle Bus tour to mark the centenary of the Battle of the Somme London Transport Museum's 102 year old khaki green Battle Bus No. B2737 will be crossing the channel to commemorate the centenary of the Battle of the Somme in France with a team of historical experts and curators from London Transport Museum on Monday 27 June 2016. As part of the Somme anniversary programme of events this historic vehicle will embark on three-day tour along the entire former front line of the Somme, in Northern France, from Monday 27 June to Wednesday 29 June. The tour will end at Thiepval for the Evening Vigil on 30 June 2016 and the bus will be on display at Albert-Picardie Airport and Albert railway station on 1 July 2016. A Routemaster Summer at London Bus Museum 26th June 2016 Dozens of London Transports iconic Routemaster buses will be marking the double-decker's 60th anniversary at the London Bus Museum summer event on 26 June. Supported by the Routemaster Association, the event at Brooklands Museum in Weybridge, Surrey will feature live bus services and excursions, and the organisers hope to have every major variant of the Routemaster on display. Land Rover Show at British Motor Museum, Gaydon 25th/26th June 2016 The hugely popular and successful Classic Land Rover Show returns for a second year at the British Motor Museum on 25 and 26 June. This year the show aims to celebrate the Land Rover as a working vehicle. Hundreds of vehicles will be on display including Fred Dibnah's 1972 Lightweight Land Rover. This year also sees the long awaited return of the popular Heritage Run, which takes place from Solihull to Gaydon and is for all pre 1980 vehicles. On the Saturday, the focus will be on the utility vehicles in the arena and the Mini Me Parade. Certificates of Merit will be handed out by well-known Land Rover experts and journalists. Commentary is provided by Diana Tigwell, with Richard Beddall and Motor Journalist David Barker, with guest speakers throughout the weekend. Throughout the weekend visitors will also be able to view over 250 vehicles from the reserve collection which are on display in the Collections Centre. Many of these vehicles are one of a kind and most have never been seen by the public.There will also be three Land Rovers on display from the Dunsfold Collection, home to the largest collection of Land Rovers in the world. Plus demonstrations, a trade area, and Club displays. FLYWHEEL Festival of Historic Motoring, Aviation and Military Endeavour at Bicester Heritage, Oxfordshire. On 2nd/3rd July at Bicester Heritage, the best preserved WW2 Bomber Station in Oxfordshire. A Heritage action weekend for all the family. Hundreds of classic cars, motor bikes and period music with a funfair. Among the classic motor bikes will be a 1924 Harley-Davidson twin cam racer; cars include a 1934 chain driven Frazer-Nash. A dramatic aerial formation display will be given on both days by Tiger 9, a collection of restored Tiger Moth aircraft, used by the RAF in early days for pilot training. Old Ford Rally Sunday 17 July 2016 at British Motor Museum, Gaydon Around 750 classic Fords will converge at the British Motor Museum when it hosts the 8th Old Ford Rally held in conjunction with the Ford Y & C Register. The show, which takes place on Sunday 17 July, is the biggest rally of classic Fords in the UK. Vehicles including commercials, tractors and vehicles with a Ford engine built up to 1990 will be on display, exhibiting the incredible range of vehicles produced by one of the world's biggest manufacturers. Visitors will be able to see a huge range from Model T s to the cars of the pre-war austerity years plus agricultural vehicles, Thames and Ford commercial vehicles plus the more luxurious post-war Zephyr, Zodiac and Granada. There will also be the Mk1 and Mk2 Cortinas, Anglias, and Escorts as well as Capris from the 1960s to the mid 1980s. 70 tractors for 70 years. Coventry Transport Museum is staging a great parade and display of 70 Massey Ferguson Tractors to celebrate the 70 years that Massey Ferguson has been associated with the city. The display will take place on Saturday 30th July in Millennium Place, just outside the Museum. The event will be supported by Massey Ferguson and the Friends of Ferguson Heritage. The event takes place between 10.00 a.m. and 4.30 p.m.
Museum in Motion at Haynes International Motor Museum, Sparkford, Somerset.On Sunday 31st Jul 2016 the museums collection is on the move - literally. See a selection of vehicles come alive as they are driven throughout the day on the museum test circuit by museum volunteers. When not on the test circuit, they will be on display to enable you to get even closer and talk to the drivers about them. Austin Seven Rally at the National Motor Museum. The 750 Motor Clubs annual National Austin Seven Rally returns for its 54th gathering at Beaulieu on 3 July 2016 from 10:00am-6:00pm. Austin 7s of all types from all over the United Kingdom and Europe gather for an event full of activities, including an Austin Autojumble, driving skills tests and concours competition.All Austin 7s are welcome (no need to be a 750 Motor Club Member). Other Austins and pre-1975 cars are also welcome - but all must be registered with the organiser. Heritage Open Days Saturday 10 and Sunday 11 September 2016.Heritage Open Days is England's biggest heritage festival involving 40,000 volunteers. It celebrates our fantastic history, architecture and culture; offering people the chance to see hidden places and try out new experiences - all of which are FREE to explore. 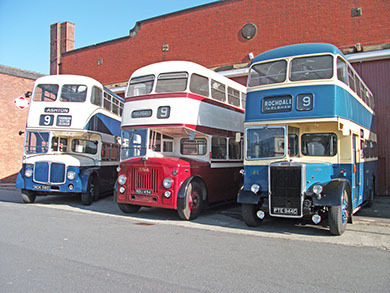 Every year in September the Manchester Transport Museum takes part by providing free admission to the Museum for the event and operates a free heritage bus service linking the Museum of Transport with the Peoples History Museum, the Museum of Science and Industry and Manchester Jewish Museum. Opening times from 10.00 am to 4.30 pm. Admission is free for this event.